1. I've always liked older men... 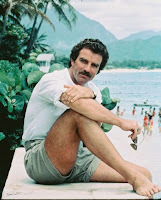 When I was 4, I was in love with Tom Selleck... Ask Momma, I would sit in front of the TV and think Magnum P.I. was wiggling those eyebrows at me :) Then from the time I hit I can't even remember when it seems like I've been in love so long... George (do I have to give a last name) Clooney... Mmmm Mmmm Mmmm... When all my friends were in love with Leonardo DiCaprio (no thank you) I thought I had found my 40 something year old prince charming... THEN, hubby! Yep, 8 years difference, which he doesn't like me to point out, since when I was in kindergarten fingerpainting he was almost in highschool... Yikes! 2. If you've read Biff's Blog comments lately you'll know that we have weird ESP moments... Another? We used to show up to school dressed exactly the same... All the time... Like, enough times that our friend Grumpy Tadhg (yes that's his name, the Tadhg part, very Irish) was convinced that we would call each other the night before to plan it out and make them all think we did it on accident. 4. I, unlike my momma, would never like to live in the country... I told hubby that when we bought a house, it had to be within 10 miles of a Target... And I wasn't kidding! 7. My brothers are 21 and almost 15 and they still call me sissy. 8. Ok, better make this a good one... Funny story... When I was little, my granny sat me down with the gigantor JC Penny's catalog and told me to look through it and pick something out for grandpa for Christmas... I looked and looked and couldn't find anything!!! Why? "Because... Grandma, there's nothing dirty in here!" Haha :) Papa was a mechanic and always had grease and dirt all over his clothes, I was confused, I guess, because I thought he bought them like that. We still laugh about that to this day! Now you know some random facts about me... Hmm... Who to tag??? Here are a few things you forgot to mention. *you make the best baklava in the world. *you make your famously delicious cinnamon rolls while listening to opera. *you are the best card giver. you always find the best ones! *you get extremely violent while watching football. yelling, cursing, throwing things! its funny. *Your always there for me no matter what!!! I love your list. 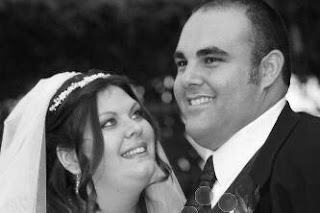 I also only dated older guys and fell in love with older actors (Sean Connery) and my sweet hubby is 4 years older. I thought your story about your Grandpa was wonderful!